Beef tips are cubes of steak taken from the tri-tip of a cow, a triangular cut between the animal's hind leg and abdomen. Beef tips are typically low-priced as the cut is inherently tough. However, if you cook beef tips correctly, they become juicy and flavorful. Try either baking or broiling for tender beef tips, depending on your desired outcome and the amount of time you have available. Remove the beef tips from the packaging; if the beef tips are more than 1 inch thick, slice them smaller. This allows you to avoid overcooking the beef tips, keeping them moist and tender. While you slice them, cut away any excess fat to make the dish healthier. Place the beef tips into a plastic freezer bag and add an acidic marinade to break down the proteins and tenderize the meat. Commercial acidic marinades are available from most grocers. If you do not have a marinade in mind, lemon juice, tomato juice, wine or vinegar work well as a base. Add seasonings, such as garlic, onion, Worcestershire sauce, soy sauce or ground black pepper, to the liquid in the marinade for flavor. Allow the beef tips to marinate in the refrigerator for four to six hours. When the beef tips are done marinating, remove them from the bag and discard the remaining liquid. Alternately, simmer the marinade over medium-low for 30 minutes to use as a sauce. Baked beef tips require a browning on the stove top for a rich and powerful flavor. Their exterior is nearly as tender as the inner meat; this makes baked beef tips an ideal candidate for pastas and sauces. The method produces a thin juice you can drizzle over the tips for presentation. Preheat the oven to 450 degrees Fahrenheit and place an oven-safe skillet over medium-high heat. Add just enough oil, melted butter or melted margarine to the skillet to coat the bottom thinly. Place the beef tips into the skillet and cook them for about five minutes, or until they have browned. The browning process ensures harmful bacteria is killed and enhances the beef's taste and texture. Immediately add enough beef broth to the skillet to cover the bottom and transfer the beef tips to the oven. Allow the beef tips to bake for about eight minutes per pound, or until the thickest one registers 145 degrees Fahrenheit on a meat thermometer. Remove the skillet from the oven and allow the baked beef tips to cool for about five minutes. 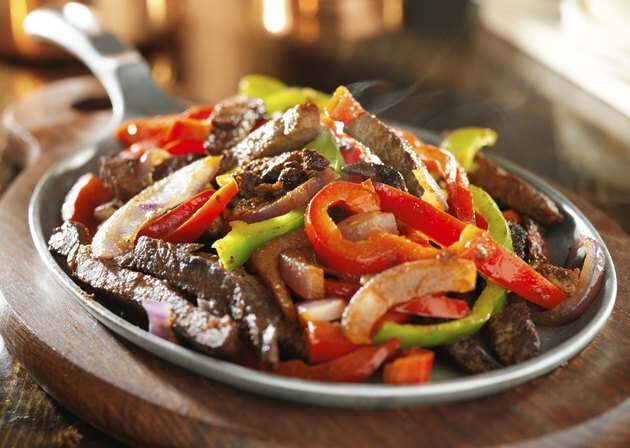 Serve the beef tips while hot; add flavor and moisture by drizzling some of the liquid from the skillet over the top. If you are incorporating the baked beef tips in a pasta or sauce, skip the cooling time. Broiling the beef tips creates a slightly charred taste with a crispy exterior that complements their tender interior. It requires a little more preparation time to prevent burning the meat. Slice the marinated beef tips down to 1/2-inch thick pieces to ensure they cook quickly and evenly in the broiler. Allow the sliced and marinated beef tips to rest at room temperature for 30 minutes to promote quick cooking. Place the beef tips into a roasting pan in an even layer and position the broiler's rack about 6 inches away from the heat source. Set the roasting pan into the broiler and allow the beef tips to cook for approximately four minutes. Use tongs or a spatula to flip the beef tips and continue cooking them for an additional three minutes or until the thickest one registers 145 degrees Fahrenheit on a meat thermometer. Remove the tips from the broiler and allow them to cool for five minutes. Serve the broiled beef tips while hot. If you are incorporating the broiled beef tips in a sauce or separate recipes, skip the cooling time. Refrigerate leftover beef tips within two hours of cooking them in an airtight container. Consume the leftovers within four days. Always reheat leftover beef to a minimum internal temperature of 160 degrees Fahrenheit. Food Safety and Inspection Service: Is It Done Yet? How Many Calories Are in Steak Tips?